Calvin Klein bags are popular and expensive but at nomorerack the price is just very low. The bag above only cost $44 instead of $149.95. CK's modern style gets a fun touch of pattern in this handbag. This is also durable, lightweight and easy to carry bag. 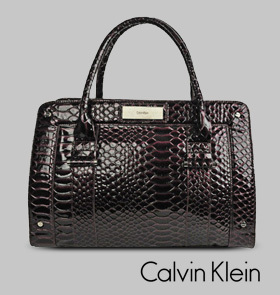 Have a gorgeous snakeskin patent vegan leather finish, sleek Calvin Klein logo details and the available Colors are pomegranate (warm purple/black).